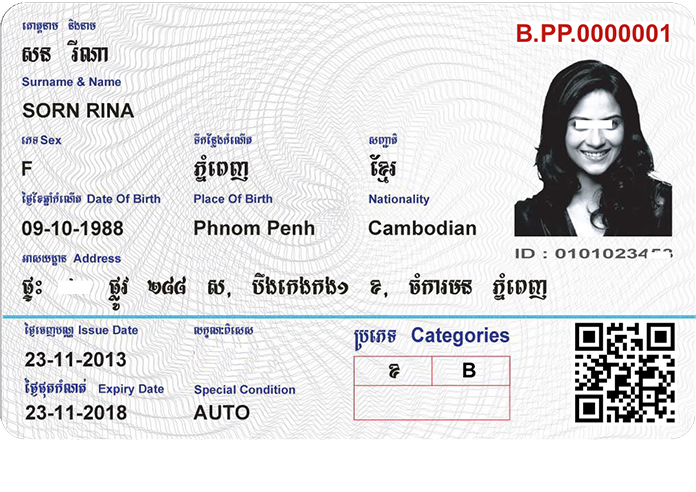 By law, every driver who drives in the Kingdom of Cambodia needs a valid drivers license. You can apply and take a test in both Khmer and English for both Type A and B driver’s licenses at one of the Ministry’s driver’s license centers which are conveniently located at Aeon Mall I, Aeon Mall II and at all Provincial Department of Public Works and Transport offices. You can schedule an appointment at these Centers to take the test via the Ministry’s online service at https://driverlicense.mpwt.gov.kh. For those applying for a Type C license and higher you are required to sit for lessons at a officially sanctioned school to obtain a certification. Contact the Driver’s License Centers for more information. B "Tourist / family car"
For driver’s license renewals, second and third renewals, of driving license of Type A, the fee is 20,000 Riels, and Type B and C: 30,000 Riels. After taking the exam, the average wait time is from 20 to 30 minutes to obtain your new driver’s license. "បើមានបណ្ណបើកបរប្រភេទ “ខ” រួចហើយ ចង់ប្ដូរយកប្រភេទ “គ” តើបានដែរឬទេ? បើបានត្រូវធ្វើដូចម្ដេច?ត្រូវការឯកសារអ្វីខ្លះ? អស់ថ្លៃប៉ុន្មាន? " "អាចប្ដូរបានតែត្រូវប្រឡង យកបណ្ណប្រភេទ “គ” ឡើងវិញ។ ចំពោះឯកសារមានដូចជាៈ ១, អត្តសញ្ញាណប័ណ្ណសញ្ជាតិខ្មែរ ២, លិខិតបញ្ជាក់កាយសម្បទា ៣, វិញ្ញាបនបត្របញ្ជាក់ការសិក្សាពីសាលាបង្រៀនបើកបរយានយន្ត(ចំពោះបណ្ណបើកបរយានយន្តប្រភេទ គ, ឃ, និង ង)។ ៤, រូបថត ៤ x ៦ ផ្ទៃពណ៌ស ៥, វិក័យបត្របង់ប្រាក់ តម្លៃក្នុងការប្រឡង ៩៥,០០០៛។"